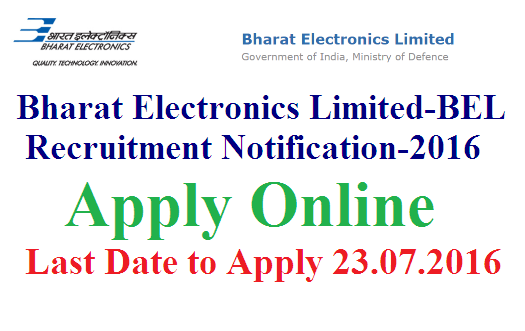 Recruitment Notification 2016 from BEL Bharat Electronics Limited BEL-Bahrat Electronics Limited Recruitment Notification 2016 Apply Online Online Application form for BEL Recruitment Notification The NCS – GHAZIABAD, SBU of Bharat Electronics Ltd. a Navaratna Company and India’s premier Professional Electronics Company, requires the following outstanding personnel on Fixed tenure for 5 years, for execution of major projects on PAN India basis. / B.Tech / B.Sc Engineering / AMIE from AICTE approved College/Institute or a recognised University. First class in the indicated qualification for General and OBC candidates. Pass class for SC/ST/PWD candidates. Min. Post Qualfn work exp. NOC: Candidates employed in Govt./Quasi-Govt. and Public Sector Undertakings will be required to produce ‘No Objection Certificate’ at the time of interview, without which they will not be allowed to appear for the interview. GEN/OBC candidates applying for the above posts are required to upload duly filled in company copy of Challan bearing the Journal Number. In respect of Persons with Disability, the degree of disability that the candidate should have, for consideration under the category, will be as prescribed by Government norms. Candidates whose Degree Certificate does not tally with the branch mentioned in the application / advertisement will not be considered for interview. BEL reserves the right to debar you at any stage of the written test / interview proceedings, if your candidature is not considered suitable for any reason. Candidates who are unable to produce their Engineering Degree Marks Card and Certificate in original on the day of interview for whatever reason will not be considered. Canvassing in any form will result in disqualification. The admission at all stages of the selection process will be purely provisional. Mere issue of admit card/interview call letter to the candidate will not imply that his/her candidature has been cleared by BEL.